Last weekend just as I was wrapping up a 2 hour shoot with Rachel and Guy, I looked up to see Rachel adjusting her veil and fired off a quick shot to get this amazing image. A lot of my favorite photos of people are taken when they let their guard down. Many of my wedding shoots involve some posing, but I’m always watching for those moments when the bride and groom relax and forget I’m there. That’s when the natural expressions emerge and I am really able to capture the moments that show my subjects at their best. As a continuation of the previous post, I wanted to share some photos from my visit to San Juan Island, one of several islands that make up the San Juan Islands. The island is only accessible by boat or air and seems to be one of Seattle’s well-kept secrets. Our tour book only briefly mentioned it and the hotel guide didn’t mention it at all. In fact, I learned about it only after chatting with a local resident while watching fish throwers downtown at the Pike Place Market. The island is known for its Orca whale sightings as well as its breathtaking scenery. We took the Washington State Ferry to Friday Harbor, a small fishing village that greeted us with its quiet charm. Instantly we recognized the island’s appeal and natural beauty. It’s no wonder the residents want to keep this place a secret. Unfortunately we didn’t spot any Orca, but we did spend a few relaxing and peaceful hours on the island before taking a ferry back to downtown Seattle. I read somewhere a while ago that photography is a great excuse to explore. This statement has stuck with me because in the past few years that I have been in business, photography has allowed me to see and do some pretty cool things. I almost feel guilty sometimes that I can have so much fun while making a living. On a recent shoot in Seattle for Microsoft and Hartmann Studios, I was able to take a few extra days to explore the Northwest Coast. Far different from the sunny beaches of Southern California, the shoreline of Seattle was rugged and wildly beautiful. I’ve mentioned before that one of the best ways to see a city is by ditching the car and getting around on foot, bike, or using available public transit systems. Whether it’s Boston’s commuter train to Fenway Park, New York’s rustic, smelly subways to lower Manhattan, or the bells of San Francisco’s streetcars as they crawl up and down the steep streets of the city, public transit is a great way for really getting the feel of a place. Seattle was no different as we hitched a ride on the Washington State Ferry from Anacortes to San Juan Island. The original idea was to arrive at San Juan to get a look at Orcas in the wild, however the ride to and from the island turned out to be a real treat. Beautiful views of the various islands and small fishing villages interrupted the otherwise tranquil cruise from stop to stop over a three hour period. In the distance as you can see in the photo above is Mount Rainier, an active volcano encased in over 35 square miles of snow and ice, surrounded by old growth forest and stunning wildflower meadows. I would have loved to spend an entire day exploring the national park, however as close as it looks, Mount Rainier is a good two hour drive away from where we were staying in downtown Seattle and our time was limited. We were able to stay on San Juan Island for several hours before boarding a late ferry back to the mainland. The night time cruise was almost magical as we slipped by silent shoreline and sleepy villages lit by only a few small streetlights and the orange windows of small, quaint homes. You can catch a Washington State Ferry right of the docks near Pike Place in downtown Seattle for great views of the city and the islands almost anytime of the day. 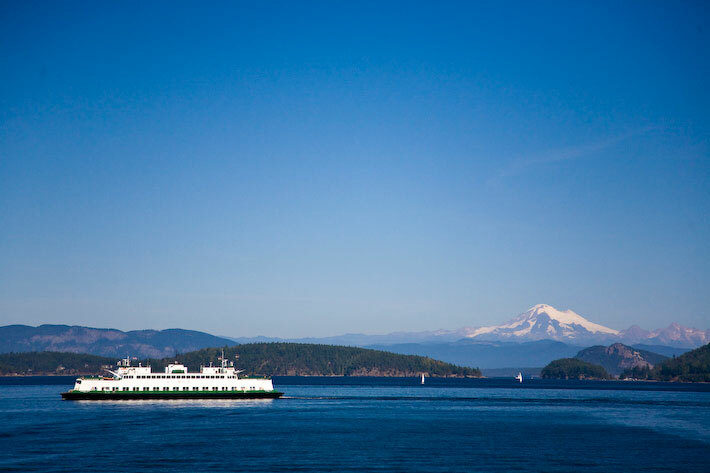 The ferries are mainly used as transportation for locals who live or work on the surrounding islands, but for travelers it is a great way to get a different view of Seattle for a great price. How lucky am I to have a chance to photograph such a lovely couple? Lee and Greg were phenomenal to work with – beautiful, fun and extremely down-to-earth. 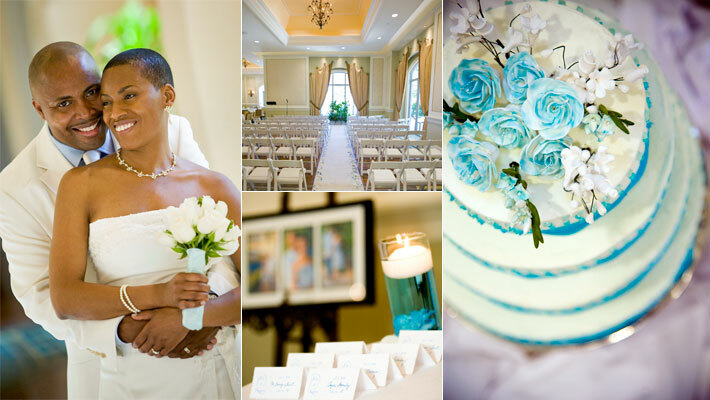 We first met Lee at a bridal show and after a scheduled consultation she booked us right on the spot. Back in June we shot their engagement session at Lake Las Vegas Resort and a couple of weeks ago they got married at the JW Marriott Resort Hotel in Summerlin, NV. The setting was gorgeous and our friends over at the JW Marriott Summerlin were especially friendly and helpful as always. The ceremony was gorgeous and the cake tasted just as good as it looks! I would also like to mention that Lee devotes much of her time working with young kids and it was so much fun to watch all the kids at the wedding dancing and having a blast. To Lee and Greg – thanks for sharing your day with me. Your album is on the way and it looks fantastic!